Every once in a while, a nugget of smiley goodness appears in my inbox. That’s how I’d describe being asked by author F.A. Michaels to participate in an ongoing blog tour about the writing process by answering four related questions. F.A. Michaels, or Mic, is the author of some amazing novels for middle grade and young adult readers. Some of those stories will come to life as e-books right off the bat. Others will land on print pages soon. Mic knows that I am passionate about books for young readers and that I enjoy a good ole fashion discussion about the writing process- which is as unique to an author as a fingerprint. I encourage you to take a look at what other authors have revealed, beginning with talented F.A. Michaels here. Go ahead, I’ll wait. I know, Mic is brilliant, right? Well, now that you’re back, I’ll do my best to enlighten you about how I work. Lately, my multi-tasking muscles have gotten a workout. In the last two weeks, I did final edits on two books I wrote for the educational market, due out this summer. I’m also kicking around new title options for my debut trade book, a nonfiction picture book coming out next spring from Lee and Low, tentatively titled STEP RIGHT UP: THE STORY OF BEAUTIFUL JIM KEY. And speaking of that debut, it will be out in less than a year. Ahhhhhhh! There’s so much to think about and plan for: book launch parties, marketing, the best pen to sign with, how to thank the multitudes of people who have helped me emotionally and craft-wise to bring the book to fruition. I suddenly feel pregnant all over again, stressing over a very long pre-baby to-do list that will lead to one beautiful event. I’m in the research stage of a new project, but I’ll remain coy for now. Partly to avoid leaks in focus that would allow some of the magic to spill from the mental process by talking about it too soon. Once the story is well rounded, fully spiced, and tightly sealed, I’ll be thrilled to talk about it. For now, I’ll reveal only that it will probably be a nonfiction picture book (unless it becomes something else,) about an almost-forgotten historical event involving war, trains, destruction, kids, adults, hunger, and gifts. I am enthralled by all I am learning and antsy to begin writing. But, it isn’t time yet. How does my work differ? I don’t know. I’m not sure that can be answered until I’m at the end of my writing career. Let’s hope that’s a long time from now. Much of the answer to this can be found in the previous question, I think. Every year, I promise myself that I will begin my novel and tackle the fiction picture books that I have dabbled with. But, I can’t seem to drag myself away from nonfiction. I love true stories. I like the sense of wonderment and awe when I learn something remarkable. People are fascinating, complicated creatures built by life experiences and dreams. Historical subjects are doubly interesting because there’s an element of detective work and puzzle-solving to realize their stories. What fun! Sometimes, I think I’m drawn to biographies because it’s a way to put logic and order to the human experience which, while we’re living life, is chaotic and disorderly. We learn from the past. People often ask where I get my ideas, which is the first step in any writing process. Ideas come from everywhere. I once wrote a magazine article about fainting goats, after catching a news segment on a local television station. Sometimes, ideas come from snippets or blips or the merest mention in newspapers or magazines or documentaries. Sometimes, it’s a curiosity that sends me to Google. Not all ideas stick. But, when a topic nags me, when I can’t stop the “gee, I wonder…” inner dialog, I know it’s one I must pursue. Something about the topic must hit a nerve with me. My research begins online, then on to books. I begin to horde copies of newspaper clippings from the day and I’ll even buy a copy of full newspapers if any still exist. It’s an ideal way to gauge what was happening in the community and the world around my subject. If the idea still has me fascinated, I’ll contact any known experts. By now, I have research files on my computer desktop and desk drawer where I deposit photos, newspaper and other articles, historical details, world events, copies of pages from books, etc. Without fail, the folder morphs into a bulging 4″ binder where print documents are cataloged chronologically. Timelines, details and sequences are categorized. Early on, I begin what I call my source notes document that is also broken into categories. From the massive amount of research I do, I extract important (to me) information and implant them into my source notes. Each source is cited on the document, for easy recall. My single-spaced source notes for a picture book biography can easily grow to 50 pages long. The categories grow and, eventually, a theme emerges. When I begin coming across the same information over and over, I know it’s time to stop researching and start writing. Information at hand, I outline over and over and over again, keeping an eye on a narrative arc. One of the most difficult decisions about writing picture book biographies is where to begin and end the story. I write, rewrite, scrap the outline, begin again. The last thing I do is pick at my word choices and finesse the voice. Ideally, each story will have it’s own voice, appropriate to the topic. I send this umpteenth draft on to my agent and cross my fingers. But there’s no time for a break. By then, another topic is nagging at me, begging to be a book. Mark your calendars for next week, May 5th when author Carmen Oliver and author/illustrator Shelley Ann Jackson will share their own writing processes on their individual blogs. Carmen Oliver, originally from Canada, is a former Assistant Regional Advisor of Austin SCBWI. She writes fiction and nonfiction picture books and middle grade novels and is represented by Erzsi Deak of Hen and Ink: A Literary Studio. Carmen has a special affinity for adorable picture books. I don’t doubt we’ll hear about sales of her books very soon. Carmen’s blog can be found here. Shelley Ann Jackson is the current Assistant Regional Advisor for Austin SCBWI while also teaching illustration at Texas State University. 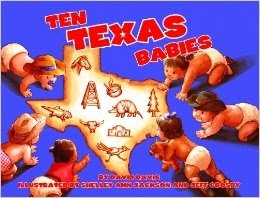 Shelley and her husband, Jeff Crosby, co-illustrated the newly released TEN TEXAS BABIES by David Davis (Pelican, 2014) as well as UPON SECRECY by Selene Castrovilla (Calkins Creek, 2009.) She co-authored and co-illustrated HARNESS HORSES, BUCKING BRONCOS & PIT PONIES (Tundra Books, 2011,) and LITTLE LIONS, BULL BAITERS & HUNTING HOUNDS (Tundra Books, 2008.) Shelley’s blog can be found here. my spring 2015 debut. I’ve been plenty busy with other projects. I’ve sold a second book (woohoo!) and revised another for an interested editor (fingers crossed.) And there are the revisions on other projects, etc, etc. But, there’s something special about this debut experience. A first book is like a first child, right? Some pre-release duties, like website updating, blogs, business cards, brochures, mailing lists, and library contacts, are predictable. Expected. But, how do we debut authors prepare for the unexpected? I reached out to some pretty awesome EMLA (Erin Murphy Literary Agency) authors and asked them what they wish they’d known as they approached their debut release and what advice they would give to those of us stocking up on anxiety. I hope you will get as much out of their responses as I have. Jeannie Mobley, author of KATERINA’S WISH (McElderry, 2012) pointed out that authors often lose a beloved original title during the pre-release revision process. Your book will be around for a long time, so it’s important to negotiate, with your editor, a title that you will be proud of. Mike Jung, author of GEEKS, GIRLS, AND SECRET IDENTITIES (Arthur A.
Levine, 2012) expands on the notion, encouraging authors to be prepared “by writing up some alternative versions that you’ll be able to live with. How about those blog tours? choosy about which blogs you agree to provide interviews for and pay close attention to the audiences they reach. For YA writers, blogs that reach book club facilitators, readers and librarians will give you more mileage… For middle grade and picture book authors, reaching readers via blogs is highly unlikely (there are a few, like http://thiskidreviewsbooks.com). “In my opinion, librarian and teacher blogs are the most worth your time (and I’m not saying this just because I’m both, I promise.) I say this because librarians and teachers are the most likely to get your books into the hands of readers…Think of a blog tour as a chance to make your audience aware of your book. Take a look at who leaves comments on a blog–is it mostly other writers, or do other folks chime in, too?” Psst…Check out the below list of librarian and teacher blogs that Natalie has shared with us! Awesome, right? publicize the book. Yours is to write the next books. For the finale to this What to Expect post, Jennifer Nielsen, author of THE SHADOW THRONE trilogy (Scholastic Press, 2012), brilliantly sums up the debut experience with a healthy mix of optimism and realism. it takes a long time for word to get out about an author, even if the publisher is doing mad publicity for you, and even if all the reviews are glowing. The fact that you are finally a published author is HUGE and amazing and wonderful, but don’t be distressed if the world continues revolving as usual on your release day. You might find your book on an end cap at B&N, or not. Don’t worry if half your family doesn’t get around to reading it for a while, or if your kids’ school doesn’t ask to host your launch party for the whole school to attend. which is particularly important with young readers because once they find a book they love, they go on a search to see what else that author has written. Do everything you can to get the word out pre-release, but put your best attention on your next project. * These last two blogs co-host a meme called “It’s Monday–what are you reading?” that draws in lots of librarians and teachers, so check out their links each Monday and read the comments. Note: This post originally appeared on http://emusdebuts.wordpress.com/2014/03/03/what-to-expect-when-youre-expecting-a-debut/ on 4/3/2014.